On behalf of the Postpartum Resource Center of New York as well as the moms, dads and families, and communities that we serve throughout the State, let me say thank you to all of you. Thank you for helping to further our mission of increasing awareness and access to care for New York State families at risk for or experiencing a perinatal mood and anxiety disorder (including postpartum depression and postpartum psychosis). Thank you for caring and for partnering with us. Together we are helping to save lives and build healthy families for vibrant communities. Wednesday, September 13, 2017 – Project 62 WNY PMAD Task Force Quarterly Meeting. Buffalo State College, Buffalo, NY. More information here. Sunday, September 24, 2017 – Fall Brunch for Bumps. Pearl at the Webb. Buffalo, NY. More information here. Tuesday, September 26, 2017 – Dark Side of the Full Moon Documentary Screening, Discussion and book signing. Middle Country Public Library, Centereach, NY. More information here. Thursday, October 12, 2017 – Maternal Mental Health Now Free Webinar Series begins about diversity, disparities and determinants in perinatal mental health. More information here. Friday, October 13 and Saturday, October 14, 2017 – Maternal Mental Health Intensive for Mental Health Professionals. Seleni Institute, New York, NY. More information here. Thursday, November 16 and Friday, November 17, 2017 – Postpartum Support International’s (PSI) Perinatal Mood Disorders: Components of Care. Great Neck, NY. More information here. Thursday, October 26, 2017 – Town of Huntington 16th Annual Women’s Networking Day. East Northport, NY. More information here. Tuesday, November 7 – Friday, November, 10, 2017 – 3rd Biennial Perinatal Mental Health Conference. Chicago, IL. More information here. Friday, December 1 and Saturday, December 2, 2017 – Maternal Mental Health Intensive for Mental Health Professionals. Seleni Institute, New York, NY. More information here. You are Not Alone. Sharing Our Stories of Hope and Healing. Personal stories of hope and healing by moms. See the stories here. If you would like to add your story, please contact us. 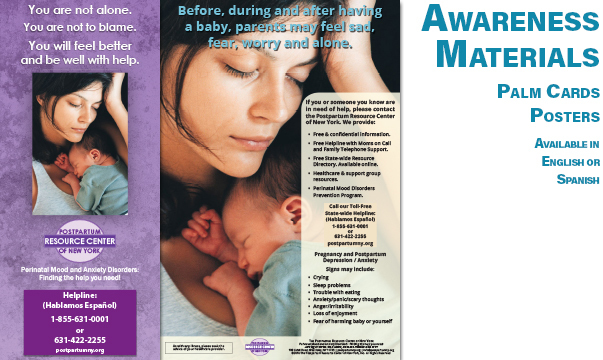 Awareness materials are a vital component to educate the public about the number one medical complication of pregnancy. They help increase awareness and getting families to the help they need. The materials are available in three different English versions as well as a Spanish language version. Project 62 is the Vision of the Postpartum Resource Center of New York. By offering prevention programs, screening and awareness campaigns, education and trainings,Circle of Caring pregnancy and postpartum depression/anxiety support groups and collaborations to increase treatment and support services, together we are better able to help save lives and build healthy families for vibrant New York communities now and for future generations. Online Directory is searchable by zip code, as well as city, town, or county. Searchable on Desktop, Tablet or Mobile Device. Available 24/7 and as a downloadable pdf. Would you like to be listed on our Resource Directory? Or do you know someone and/or organization who should be listed? If so, please go or direct them to our application, which can be found here. To reach our social media pages, please click on one or all of the social media icons below. Sounds of Silence, Friends of the Postpartum Resource Center of New York is a fundraising committee of our non-profit 501(c)(3) organization. To learn more about Sounds of Silence, please go here. Project 62¨ – Building and Strengthening Perinatal Mental Wellness Parent Support Networks and Safety Nets in all sixty-two New York State counties. Click here to learn more and get involved. To see our most recent IRS 990, please see our listing at the New York State Charities Bureau, which is the New York Attorney General’s one-stop resource for charitable organizations, fundraisers, grant makers and members of the public. You may also obtain a copy our IRS 990 by sending us a request by email or mail. Please send mail requests to: Postpartum Resource Center of New York, 109 Udall Road, West Islip, NY 11795.